Do you have a multi-niche blog? As a new blogger, many have questions and queries about having a multi-niche blog or single niche blog. So in this post of mine, I will be trying my best to explain it. For those who are not familiar with the term niche. Learn the Difference Between a website and a Blog. How to become a perfect blogger? Which is better a single website and multiple websites. In the field of SEO and Blogging, when we are writing on a particular topic then instead of using the word Topic we can use the word Niche. Many Pro-bloggers are using the word niche instead of the word topic. When I was a beginner in the field of SEO as well as blogging, I wondered if the niche was a very big thing and as like pro-bloggers used the word. Although now, Let me explain to you what niche is? Niche is when we have created a blog only on a single topic like I am running my blog and it is almost about SEO and internet marketing only, so the niche of Blog is SEO and internet marketing and if someone is running a blog about development the then they have different Niche. A niche can be about the SEO, Technology, Science, and Programming or be depending on the blog owner. Start your Own Blog with WordPress. The Question that you should ask yourself before starting a Blog? Before you start a blog, you must ask yourself that what kind of blog you want to run, a Multi Niche or Single niche blog. Many new bloggers want to go for a multi-niche blog because they want more traffic and wants to earn a lot. But whenever I ask a new blogger that what kind of blog do you want to run than their answer is always like this one, “I have more interest in photography, fashion, technology and much more” they almost want to cover all the topics in one blog. But if you want you to make money by monetizing your blog with Google AdSense, Infolinks or some other monetizing networks like these then you should go for a single niche blog with the quality content and make a better reputation with it. But if earning is your secondary option than running a multi-niche blog is the best options. Why is a Multi-Niche Blog not good for SEO, earning money and readers? A Multi-niche blog is that blog in which you can write anything according to your will or do just for fun. There are bloggers out there who are running a multi-niche blog to earn money online and really making lots of money, but that’s a way difficult task. A Multi niche blog needs more than double effort, but it is worth the effort. Because of the competition on the internet, it has become a lot difficult to make money by blogging these days. Although it is possible to earn money through Blogging. So, there are some bad aspects of a multi-niche blog. SEO which stands for search engine optimization which is an important thing by all means. It is a lot difficult to do SEO for a multi-niche blog. Due to the recent changes in the Google’s Algorithm, it has become much important to focus on a single Topic blog instead of going to a Multi-topic Blog. Google’s Rank Brain is responsible for showing results in the SERPs and is said to be the to be the artificial intelligence system which learns on its own. I will give you a perfect example which will help you to understand better that Single Niche blog is good for SEO. If you are searching on the Google about something, suppose you searched “Pet caring.” Then you will get those sites on the first page which have similar kind of niche or content. The sites which will have content about animals will appear at the top; there may be a little chance that a multi-niche site appears on the first page. The Organic search will be better for a Single-topic then a multi-topic blog. The only reason Google will give more preference to single niche blog is that those sites may contain the more information about that same keyword and also share some internal links for the same kind of information. Some other factors which may be responsible for results appearing on the first page of the Google’s SERPs are Page Authority, Domain Authority, and Type of content written. These factors will be given preference but prior to the blog that has all the good information with these factors and searched topic. I have always seen that a single niche blog gets ranking and results faster and better than a multi-niche blog. I have seen multi-niche blogs with more than 500 posts but with the domain authority like 30 to 40. But whereas blog with single niche having 40- 50 post will have the same domain authority. Although, according to my five and a half year experience says a single niche blog performs far better than a multi-topic blog. Obviously, a blogger writes content for a particular audience. If you are not targeting the audience, then it is one of the top sins of internet marketing you are doing. If you are running a multi-topic blog then you alone can’t handle that blog, you need a team who are efficient in their fields. That means you have to hire different people who can write on different topics like if you want to run a blog about pet, photography, animals, SEO, and technology, then you have to hire people who are perfect in those fields and know about these topics. When people like a blog or want to get updates about something then what they do is subscribe. So, sometimes it becomes a lot difficult to get subscribers with a multi-topic blog whereas with a single niche blog you can get a lot of subscribers who are interested in your blog. I run a blog that is almost single niche. I cover the topics about SEO and internet marketing, and I more preferably subscribe to those blogs which are related to internet marketing and SEO. I rarely subscribe to the Multi niche blogs, because I don’t need the unnecessary stuff in email. So, like me, other bloggers or readers will subscribe to those kind blogs in which topic they are interested. How can you unsubscribe from Annoying emails in Gmail? How to become a respected expert in your niche? Multi niche blog will make more money, or single blog niche will make more money, this is the question that always comes to the mind of a new Blogger. Income of your blog is directly proportional to the traffic and quality of the blog, so single niche blog has a better quality as compared to the multi-topic blog. You might be thinking that a blogger having the multi-topic blog will get more earning, but it’s not the case. Suppose you are having a blog about “pet food” a single niche blog and another blog about “pet food, photography, plants and some other things” a multi-topic blog. And you are promoting a product on pet food. Do you know which blog will earn more for you? A single topic blog will surely make more money for you because you will be getting targeted traffic to your blog with a niche product. Whereas with a multi-topic blog with more traffic will earn you less than a single topic blog because the traffic is not targeted. Regarding ROI (return on investment), a single niche blog is better. Search engine optimization techniques that work for me. What is the best way to find a Topic for your blog? The experts say that start a blog about something you already know a lot or you an expert in that field. I choose the topic SEO and internet marketing for my blog because it was my field and have an experience of working with SEO companies for five years. But you can also start a blog about something you are more interested. As if I am more interested in photography then I can start a blog while I can earn from it as well as learn to implement new things. If you are a newbie and don’t even know the basic of SEO or Blogging. Then I suggest you to first start your blog on Blogger or other blogging platforms which are free and no financial investment is needed the only thing needed is your effort. I have written some post which may help you to get traffic and help you to earn money. You can check a complete guide on SEO for beginners and also some of the things that hurt SEO. Although I suggest, you start a single niche blog in the beginning if you want to make money for yourself. Having a multi-niche blog will be a burden and needs lots of investment but it is much needed, and also, it will be hard to get a return on investment (ROI) as quick as possible. And now I would love to get your thoughts on the topic “Multi niche blog Vs. Single niche blog”. Do let me know what do you think that we should go with a single topic blog or multi-topic blog. a multi-niche blog. This is something that a lot of people don’t truly understand. I liked this – “Income of your blog is directly proportional to the traffic and quality of the blog, so single niche blog has a better quality as compared to the multi-topic blog. You might be thinking that a blogger having the multi-topic blog will get more earning but it’s not the case. A single topic blog will surely make more money for you! ” Great explanation! Thanks for the kind words Kathryn. Hi Robin, I can honestly say I agree with you about the newbie wanting to take on everything. It is so difficult to choose which area to go into that you do try and do everything in one blog. Sometimes you sort it out and find your direction, sometimes you then start more than one blog, try to keep them all up and fail miserably! The biggest reason for failure is that they want to cover every topic. If you have a blog post and your theme is cat biscuits… then you can blog all about cat related posts… but if you start talking about goldfish then it’s really going to confuse your readers and possible could confuse the social signals to and from google… you need to remain on topic and relevant with each post… In my opinion. Sticking to the one niche will interest the google as well as the people who are interested in the same niche. Hey Robin, It is Good stick with one niche to get Google traction, after that we can expand our niche. My choice is single niche blog to keep your mind and actions focused to what you are going to do and why you are doing so. Micro niche sites would make more than a multiniche site will be making. This is my personal experience. Thanks for writing a very useful article. Going for Multi Niche blog is like going on a long drive. And and thanks for your kind visit and comment. Nice topic and a great article around it 🙂 Personally I started my blog with different niche altogether in a single blog and found as a mistake within few months. It is not bad to start a multi_Niche blog and get succeeded (many multi-niche blogs are there in top100 blogs global list) but they need very high regular updates and lot of teamwork to cope up with the trending news and updates. On the Other hand, Single niche is stress-free and you know what you are doing and how to do it without complications and confusions. For a newbie blogger, starting with a single focused niche is the best way to startup!! Yes for newbies and who handle their blog alone, a single niche blog is the best thing. And secondly thanks for visit and the comment. Hello Robin, This was an interesting topic for me! I guess I never really gave much thought to whether my blog would be a single topic blog or multi-topic blog. HUM? I do know that I do write about different things, but they are all based on gaining success online. You have been to my blog, I am curious about what you think? Is it a single topic blog or multi-topic blog? You may be knowing your blog better than me, but One thinks I know I that I always find useful content on your blog. You have delved deep into the concept of niche blog. I still see some bloggers who still want to write on so many topics and make money with thier blog. 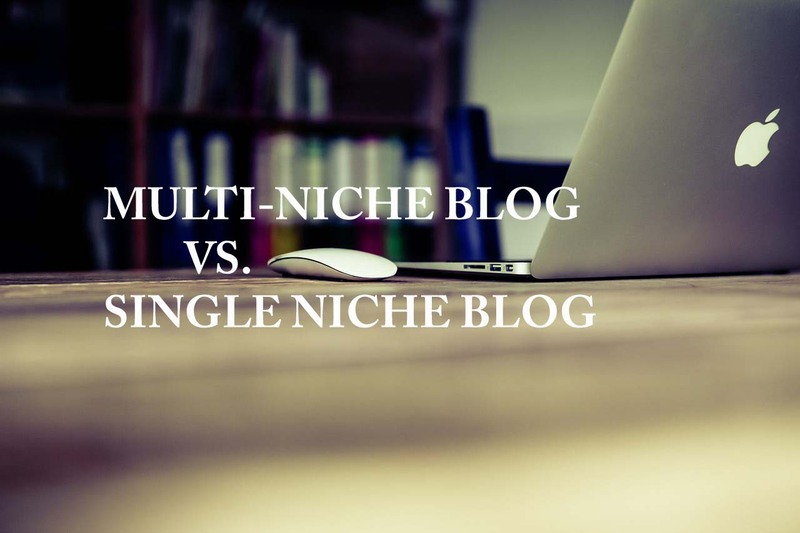 As you have shared, multi-niche blogs have its pros and cons. Single niche is better AND you have to call it a single niche if two niches mesh well enough say for example surfing and sun screen products are both just the niche of surfing since you might need sun protection. I would end up writing about sun protection if I wrote about surfing. AND that’s because you can never run out of ideas to write about because if you did then you may as well start a second niche because you finished your single niche at a time strategy. Yes, Expanding our niche is not a bad idea but going on a lot different topic creates a problem. Thanks for the visit. What excellent advice you have given here, especially for the newbie bloggers – and they keep pouring in every day lol. When I started, I didn’t know what the heck I was doing and had a multi niche blog, but soon learned that was the wrong way to go about it. Now I have a few of them. The one you visit all the time is all about blogging and internet marketing….which goes hand in hand. When it comes to my niche blogs…I have to depend on SEO and tons of research. They are fine tuned for monetization of e-commerce. But so far so good! Sometimes Choosing a niche becomes a difficult task, and A proper research can save from making this kind of mistake. Also thanks for stopping by and commenting. Great post and I do have to agree with you. We do live in the age of google symantecs which means that Google is more human and rank those blogs that are single niche and cohesive with their topics. This is why it’s so important to target a specific audience with your blog. It’s true that you can have a successful multi niche blog but it’s more of a challenge. If there’s no relative connection with the topics then it would be hard to get ranked well and drive organic traffic. But with the multi niche blogs I’ve came across I’ve found that usually they will have a lot of guests on their blogs. This helps to get their content shared and generate traffic by other means. Thanks for the share ! Have a good one! Google’s Rank brain is responsible for artificial intelligence, and you are right that Google is behaving more like humans now.Thanks for your visit and kind comment. Very informative article,thanks for the information and keep writing such amazing articles. focusing on specific niche and multi niche has their own advantages,if you are using single niches means you have more loyal visitors as mostly those interested in that niche visit you and at same time multi niche also good for growing big as users are happy to read multiple topics at a single place. Yes, Both single niche and Multi-niche has their own advantages and disadvantages. I Agree with you that a Single niche performs much better than a Multiniche blog. I learned many new things by reading your post. Great post! I guess If an individual blogger wants to have more traffic, they need to choose a single niche to avoid making visitors to think twice if its content is relevant to what they want to see and expect for example blogging tip. My point is visitors will go for blog that will not confuse them what your next blog post will be. Yes, a blog must not confuse the reader. People are up for the different niche and it’s good. Having a multi-niche blog can be more productive. Though the SEO would be somehow hard but I am totally in the favor. People should try new things. Yes, If you have money and time then you should go for the new things for sure. I was in a dilemma when I first started blogging. I started a multi-niche blog and struggled with it. Kudos to Aha-Now. She is doing great. That makes me wonder why others make it with multi-niche blogs. I’m comfortable working on my single-niche blogs, now. Glad to read your informative post and your effort makes every things clear about this subject. If we are starting a multi topic site or blog we should try in making a rough list of the topics which we will covering in our blog. This will be helpful in making strategies for our blog and also helps in collecting and targeting the contents for topics in blog. Eventually, thanks for sharing your ideology in deep. I am glad that you liked my post. Have a good week ahead. Thanks Robin for sharing multi and single niche blog I am also starting a blog on single niche like healthy tips bcoz I am beginner in blog. so I am started only single niche so i think its correct discussion for me. I would say there are pros and cons of both type of blogs. Single niche blogs are good for ranking whereas multi-niche blogs take more time to rank. I have some single micro niche sites and have seen that doing SEO for those sites gives result faster. But, I am still a person who loves multiniche blogs. However, even in multi-niche blogs, there should not be too off niches combined. You are right that even a multi-niche blog must have some limited topics. Although, thanks for sharing your opinion with us. Good post. But if you have passion on say, 3 areas , it’s frustrating to be locked down, ( particularly if ONE area is your career) but you constantly comment on twitter ( or in general) about another area of passion. 2 blogs?? What does one do? I’ve been wrestling for months!! But i have a query if my blog is of Coupon Niche and i post Tech Article will it affect my SEO because i saw that on coupon blog the traffic source is only india and i can earn much enough through adsence can i post more tech posts? You can write about coupons and deals instead of SEO or others; it will be a lot easier for you and Google as well to rank. Sometimes it’s difficult to manage bulk content on the same topic by newbies but making a blog in relevant niche categories like Business blog may have a section of finance, stock, or HR related matters would help to get better content while keeping a single business category. I also agree with making the site in the relevant niche, but it’s difficult to write on the same topic. I will share it to my SEO circle. Thanks for the share Tanisha. Sites in a relevant niche are good, even SEO becomes easy. This is very interesting. I am about to start my own blog about travel because that is what I am interested in. I did travel to a few places but not as much as the pro`s. It could be a challenge starting a travel blog if you do not have much experience. What I am thinking is to concentrate on this niche and probably post about places where I have been to and places that I want to go to in the future. Again, this post gave me an idea of where to start. Thanks. Thank you for sharing. Great work. Keep up the good work. Superb Sir, The biggest reason for failure is that they want to cover every topic. Single-Niche Blog Is Better because u know where you have to focus. Whereas in multi niche blog is quit difficult to handle. Your Post Really Helped To Distinguish between these two. i am digital marketing expert. i recommend only single niche blog..
if you are the seo expert and you want to start the blogging, i will suggest you digital marketing niche.. This is very interesting. I am about to start my own blog about tips and tricks because that is what I am interested in. this post gave me an idea of where to start. thanks for this post, does article related to a particular count regarded as multi-niche. kindly check my blog because I also blog on articles about Nigeria including Technology, education in Nigeria. If you are new in blogging then i would like to suggest to go with single niche as google give the importance to single niche blog and you can get good ranking with single niche…. my website is based on knowledge, ideas and tips in this I choose the topic that is passive income, business ideas(entrepreneurship), lifehack, best books, and tips& tricks. so is it multiple niche site or single niche site? For the time being it looks to me a Single niche website. Hi I read your blog. My question is, does google recognize all the content of the website or the specific topic itself in a website? So for example, if I am a writing everything about guitars in my website and the readers search something about guitars in google, does it improve my SEO since my website talks everything about guitars? Compared to writing a specific blog about guitars with good content however the website talks about multiple niches like cars, cellphones, drones etc…? I thought google ranks a good content of a topic even though the website talks multiple topics…I would appreciate if you clarify this. Google ranks good content. But A particular site about the guitars will be ranked easily as compared as a good post on some other niche. That is because a niche based provides the same kind of information needed to the user. Thank You, Robin, for this amazing article! I read the article and all comments so I can have a clear idea. But I was a little bit confused about multi and single niche website since I didn’t do a search about this topic until I created my website and choose a domain name and created articles. my problem is that I can’t know if my website is a multi or single niche website, I can say that my website contains book reviews and animated book summaries and articles in different categories like (self help, health and fitness, productivity, business, …etc) and some subcategories (in every category) . I create articles on that specific topic and I add banners for that product and I keep working on that topic until I get the result. what do you think? is this a multi-niche? I’m internet marketer for 4 years ago and I still consider myself a beginner. I want some advice from you. It looks that you are running a multi-niche website. Just keep working on it and You will reap the good results. Thank you Robin for your response and encouragement. Thank you sir. Now it is clear for me which is best Multi-Niche Blog or Single-Niche Blog. i am also agree with making the site in the relevant niche, but it’s difficult to write on the same topic. I will share it to my SEO circle. I think, if you are new in blogging field then you have to go with a single niche.